Recently in our online ed tech class we have started digging into how we can use the iMovie app to integrate technology into our classrooms. This is a great app to find exciting new ways of introducing materials to students! The biggest part of iMovie that I learned about was the fact that you can make movie trailers on iMovie. I had never heard of this feature before, but now understand the great benefits it can present to us as teachers. It can be used to start off a class as a hook rather than just being us as teachers talking everyday. This would be a great tool for students to use as well because they could present a bit of their material on projects, such as pictures, before creating a final project. Making a a trailer is simple and easy to use. There are a variety of templates to choose from. Once you have a theme that you think is fitting for the project you are making, all you have to do is edit the text and insert the videos/pictures that you want. Again, this is a great tool for students to use because the templates help guide them as they learn how to use the functions of iMovie. I am excited to start using iMovie to create full length videos. I have only made a few before, but really enjoyed using the app. iMovie presents so much in making a quality and educational video. There are iBooks through Apple Teacher that you can downloaded to help guide you through the process of making videos. I am looking forward to figuring out how to use all of the features that are included through iMovie such as transitions, overlaying videos, and so much more. iMovie is a great resource to start integrating into the classroom. 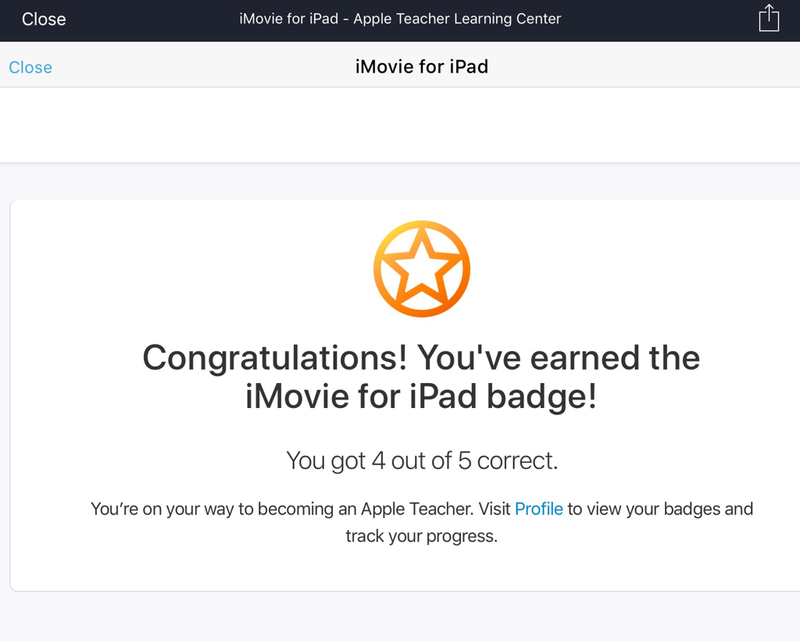 To prove that I do have an idea about what I am discussing, here is my Apple Teacher iMovie badge!